But there I was, standing in the bookstore with this pink and yellow book, a handwritten typeface in a sea of Helvetica just staring back at me. I knew, right then, that I wasn't going to be able to stop myself from buying it possibly just so I could have something to direct my sleep-deprived grump at. This book and I were going to do battle, and I was going to win. As it turns out, I didn't win. I didn't win at all. I'm really glad I lost, here. The cover presents this novel as just another teen romance. What's actually contained between the pages is something completely different. OCD Love Story is a painful read. This isn't because it's badly written (though it has it's moments, much like any other book.) 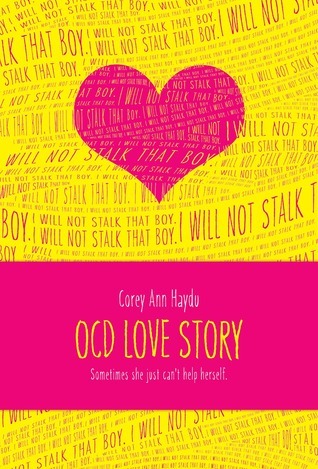 What Corey Ann Haydu has crafted here is an honest look at what it actually feels like to have OCD. The MC is deeply flawed, and spends a great deal of time trying to convince herself she's not. The story starts out with a black out at an inter-school dance, with the MC's spidey sense kicking in enough to locate someone having a panic attack in the dark. She manages to calm him down, having been through at least one before herself. Then, she kisses him when he clearly does not want to be kissed. He escapes, and she honestly doesn't seem to understand that she's done anything wrong. It's the first of many instances of the MC crossing lines without realizing she's doing it and it sets the tone for the entire book. From listening in on her therapist's other clients from a strategically placed chair in the waiting room to her endless notebooks that, in her mind, justify her own belief that she's a horrible person who is absolutely going to hurt someone because seemingly “normal” people just “snap” all the time, the story paints a gripping and painful picture. This is not a light hearted teen romance. This isn't even really a romance at all. Yes, it is a love story, but even after sitting with this book for a while I'm not sure there's any specific outlet for that love. The MC isn't a reliable narrator. There's no way she could be. Everything she thinks and feels is filtered through the lens of a disorder she doesn't even want to admit she has. The reader actually sees her developing new compulsions over the course of the book, adding to an already overwhelming list of things she needs to act on for the greater good. The self-denial of being so-called “crazy” or the measuring of your own problems against someone else's like it might somehow make things not as bad as they actually are gets worked in beautifully. I devoured this book. I almost wish I hadn't, because I think in consuming it so quickly I initially came to the knee jerk conclusion that it just wasn't that good. No, it was that good. It was also that raw. A book that can tailor itself to a YA audience while also leaving you feeling like a wound's been ripped open no matter what the ending might be is something that deserves to be processed and acknowledged for what it is. It also deserves a better cover.